Every human and animal has problems sometimes. I'm afraid I tend to ignore the people part of the equation - they seem to be able to take care of themselves. It's the animals I worry about. Who takes care of them and answers their calls for help? I was born with a unique, and sometimes problematic, ability to hear what animals have to say. Let me tell you, they are never at a loss for words! The squirrels chatter endlessly, gossips all of them. Dogs tend to be anxious about when and where their next meal is coming from, though they also worry about their people quite a bit. Cats, of course, are self absorbed but they are also very good at noticing details of what goes on around them. My marmalade cat, Baylor, has saved my life more than once because he alerted me to a problem I had missed. My human friends can be helpful when it comes to figuring out what's going on during a difficult or dangerous time. But let me tell you, I would trust the word of a rat over some other humans I know. I am Mary Catherine Roberts. Some people call me a pet psychic and certainly I have found financial support using that title. But what I am first and foremost is a human who listens to the voices of those around me, no matter how small or seemingly unimportant they may seem. 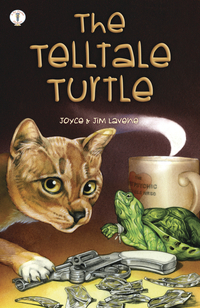 Look for the pet psychic, Mary Catherine Roberts, in her own mystery, THE TELLTALE TURTLE, from Midnight Ink Books. We don't worry a lot about our next meal because our human always provides that. But we do worry about her and the predicaments she gets into with other people. Mostly, we like to chase each other. We would like a flock of sheep of our own. Can you help with that? I knew squirrels were gossips! I just knew it! Must redouble efforts to run them off the property.